Did a Movie Star Lead the Invention of GPS? They’re beautiful, they’re rich, and they live the types of lives that most of us can only dream of. Whether it’s deserved or not, the Hollywood elite isn’t generally considered to be the smartest of our society. This isn’t to imply that they’re clueless or ignorant by any means; you just don’t expect the A-listers who make their living off of looking good and mugging for the camera to really need to have the kind of brains that can revolutionize the scientific field for generations to come. As a result, you may wonder why anyone would ask if a movie star lead to the invention of GPS technology? Enter Hedy Lamarr, stage right, leading lady for MGM throughout the late ’30s and ’40s in such films as Algiers and Cecil B. DeMille’s Samson and Delilah. Originally from Vienna, Austria, the famous film star was also a self-taught wartime inventor whose efforts to help the United States Army during World War II led to the technology that would become the precursor to Bluetooth, CDMA, Wi-Fi, and GPS tracking. She was once dubbed “The Most Beautiful Woman in the World,” but there was much more to her than her pretty face, and we owe a lot to the brain behind it. History is full of examples of women who quietly spearheaded evolutions in human ingenuity and then went ignored in favor of the men who relied upon their work but never bothered to properly credit them. These women include innovators and scientists such as Rosalind Franklin (the structure of DNA), Esther Lederberg (genetic inheritance in bacteria and gene regulation), and Chien-Shiung Wu (the development of the atom bomb). 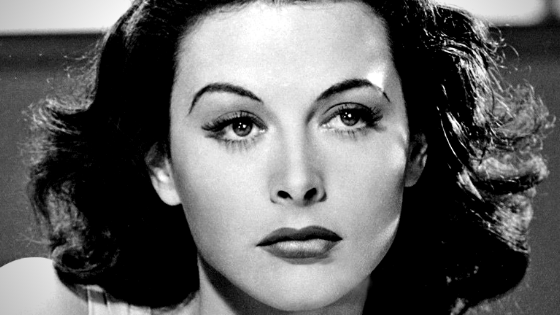 While Hedy Lamarr did receive a great deal of genuine recognition for her invention, much of it would not come until many years after her work was completed, largely at the end of her life and after her death. During her peak throughout the 1940s, Lamarr was typecast on celluloid as a glamorous, exotic seductress thanks to her Austrian heritage. She didn’t care for the Hollywood lifestyle, however, neither drinking nor partying in her free time. Instead, she took up tinkering as a hobby. Her projects included an improved stoplight and a tablet for making carbonated drinks, and as the events of World War II began to unfold, she became determined to help the Allied cause. Her focus became torpedoes, which were being radio-controlled to increase their efficiency (a new concept in naval warfare) but were being easily jammed and set off course. In 1942, she and co-inventor George Antheil received a patent for a “Secret Communication System,” designed to allow a radio signal to randomly hop from frequency to frequency to confuse attempts at locking onto it. Though it showed promise, the Navy was uninterested in the outside help at the time, and kept the patent classified but untouched for years. It wasn’t until the 1960s, when attempting to develop a “sonobuoy” — an ocean buoy that could detect nearby submarines and transmit the information to planes — that the idea was considered seriously by the naval research laboratory. The rest, as they say, is history: the success of the concept spread like wildfire throughout the rest of the military, and the fingerprints of the technology would build the foundation of what would later become wireless communication in its many different forms. Lamarr’s contribution, unsurprisingly, was lost in the uproar, and it wasn’t until near the end of her life, in the late 1990s, that she would finally be recognized for her contribution. A decade after Lamarr had initially submitted her idea, another woman would similarly make only small waves while she went about changing the world. Gladys West spent 42 years working at the Naval base in Dahlgren, VA. Her time there made her an instrumental part of the team that developed the initial concept for the Global Positioning System that would begin its rise to importance when the first GPS satellite was launched over twenty years later. West’s career began in 1956, as the second black woman to work at the Dahlgren base and only one of four black workers there. Computer technology was only beginning to be explored, and West, as a mathematician, spent her days collecting data from orbiting satellites — focusing on that information which helped the team determine their location above the planet — and feeding it into room-sized supercomputers. She also worked on software that would allow computers to process “geoid heights” — the exact elevations of physical surfaces. While she didn’t know at the time just how important these tasks would become in future decades, Gladys was recognized as an invaluable asset to the team. Her department head would later commend her for her accuracy with sophisticated algorithms and the sheer amount of data she was able to process in an efficient but reliable manner. She retired in 1998, and her contributions were only brought to public attention when a member of her college sorority read a single line about her involvement in the biography she submitted for a school function. She was inducted into the Air Force Hall of Fame just last year and is currently working on writing a memoir. And, yes, she prefers using a paper map when she travels. After all, the data points on her phone could be wrong or outdated, and she, more than anyone, would be the one to know. A technology as globally prevalent and extraordinarily complex could not have been sent up and running by any one person, of course. Plenty of others would help pave the way to things like GPS tracking, via GPS devices and GPS receivers, as well as fleet tracking and asset tracking in the years after Lamarr and West’s initial work built the foundation upon which others could later see their initial ideas to fruition. Furthermore, Lamarr’s frequency-hopping spread spectrum (FHSS) is the cornerstone of Bluetooth’s ability to wirelessly transmit data (as is necessary for any kind of satellite-based technology), and West’s mathematics were integral to the establishment of accurate satellite geodesy, which is the ability of the machines to measure the form and dimensions of Earth properly. Scientists Ivan Getting, Roger L. Easton, and Bradford Parkinson are credited with the creation of the Global Positioning System. Getting helped design the concept for the earliest satellite-based navigation systems for ballistic missiles and was a tireless advocate in getting the idea funded against considerable initial pushback and disinterest. Easton co-wrote the Project Vanguard proposal to establish the American satellite program, designed the first system to detect and track Earth-orbiting objects, and conceived time-based navigational tools for satellites, which culminated in the launching of NTS-2: the first satellite to transmit GPS signals. Both of these men’s efforts would culminate with the career of Parkinson, who was the lead architect and developer of NAVSTAR (the original name given to GPS) who finally got the system built, funded, and launched in 1978. GPS tracking has come a long way in the years since Hedy Lamarr’s a well-intentioned desire to help that became one of the first dominos to fall and eventually culminated in the convenient and powerful GPS technology that we all rely on today. Many women and men deserve recognition for the accomplishment, and while it’s more convenient to boil something so complex down into an “X discovered Y” mentality, it’s vital that the bigger picture is remembered. Sometimes, it’s good to be reminded of what people can accomplish when they put their heads together, even if it’s done accidentally and over many decades. So, to answer the question posed at the beginning of this post: Did a movie star lead the invention of GPS? As with most things, it’s arguably a bit more complicated than a simple “yes” or “no” — similar concepts had been toyed with as early as 1899 by the Italian inventor Guglielmo Marconi, years before Lamarr’s patent. The answer, then: She did, but she was not the only one at the bow of that particular ship. It was, as they say, a meeting of the minds, albeit one that happened without her intentions and would take the rest of her life to complete its mission. Human ingenuity is funny that way.